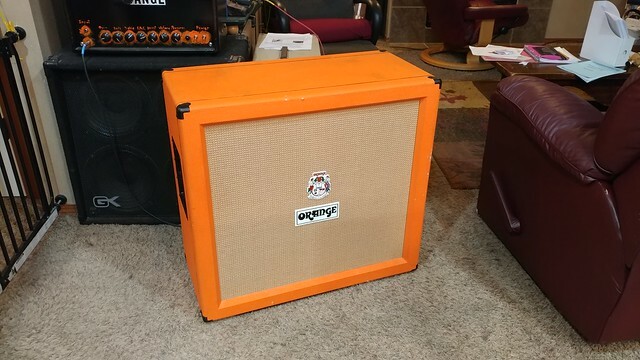 I got a good deal on a 90's Reissue OD120 and a Orange 4x12 Cabinet. I am pretty excited. I have wanted one for awhile. 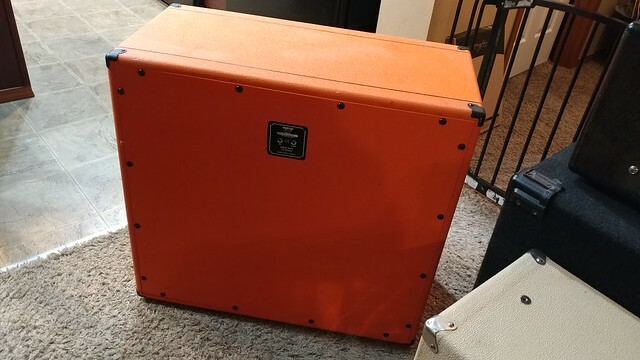 It was super cheap after trading two guitars towards it. I only have the cabinet so far. The head is being serviced. My question is on the impedance. I used my meter to check the tip and side of the speaker cable. In one input I am reading around 11 which would make me think the speakers are set up for 16ohms. The other input reads 79.... Is there a chance that other one isn't connected to anything? 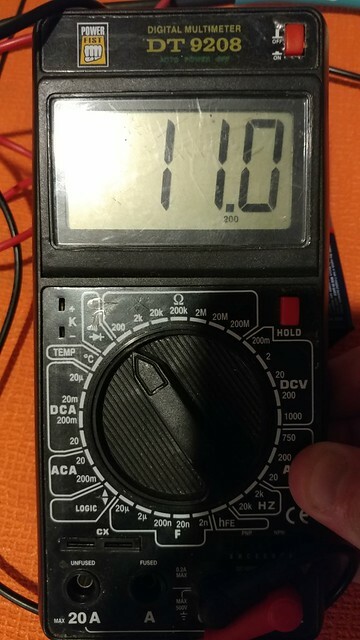 Do I have my meter set on the right setting? Here is some pics. 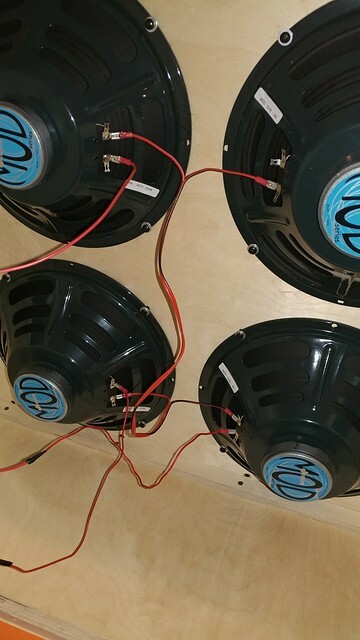 The stock speakers were replaced with Jensen MOD speakers. I am just wondering why one is reading so high and the other not. Here are pictures of the cabinet. It is pretty cool and worn. The bottom of it has two wooden boards running across instead of rubber feet. Is that normal? Last edited by HNB on Sat Dec 15, 2018 7:27 pm, edited 1 time in total. Did some google work and found out that the wooden boards on the bottom are normal. 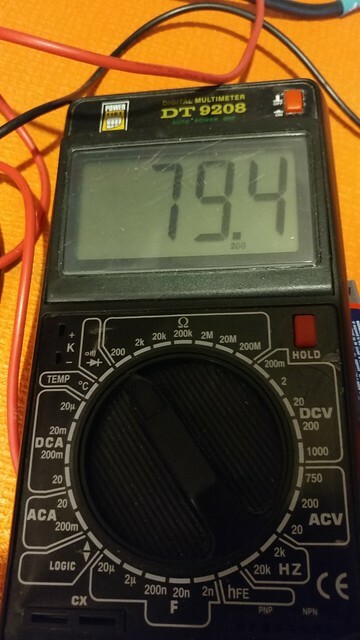 Still not sure why the in is reading almost 80 and the link is at 11 ohm wise. I guess I could always open it up and look at the guts. Last edited by HNB on Thu Dec 06, 2018 7:09 am, edited 1 time in total. It may just be wired for a line out on the second jack, there would be some resistors in there somewhere, people like to hide them for some reason. Also could just be a corroded jack, check the jacks and the contact points of their switches, give an a buff with some 1500 or 2000 grit. Or could be a speaker is damaged. I would just disconnect everything and measure each speaker on its own and wire up from scratch, bestto be certain when higher powered amps are in the mix. Also make sure you have a fresh battery on the multimeter.. The second jack is labeled "Link". I'm assuming it's supposed to be used to connect a second cab. Have you tried measuring it with the "In" jack connected at the same time? It looks to me like the wiring setup is the "2 parallel pairs in series"-scheme that you'll find in most Marshall 4x12s. If the speakers are 16 ohms the total impedance is also 16 ohms. Even if having something in the input jack and measuring the link jack solves the problem there is still something either wrong or not understood, both are potential amp killers. 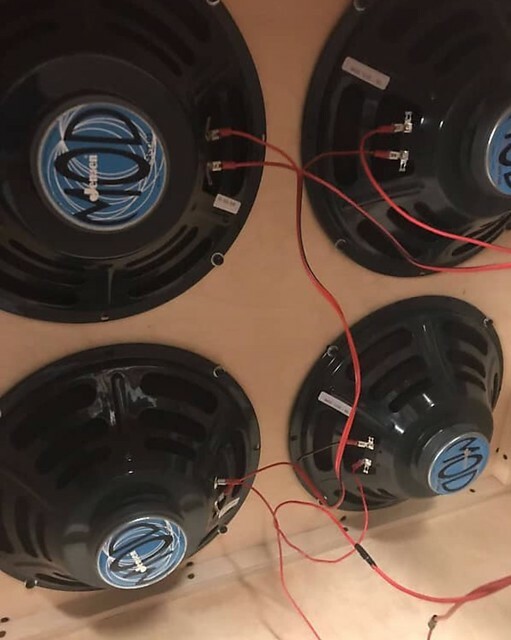 The most you should be able to read for dc resistance is 50 odd ohms on a cab like that, and that is in the unlikely situation all 4 speakers are in series, which is generally not a good idea. Yeah, but the "Link" obviously isn't meant to be used as an input alone, otherwise it would also be labeled "In". If both jacks have about 11 ohm of DC resistance when both are plugged in, the cab is most likely working as it should. But if it's the "In" jack that reads 79,4 ohms when used alone, there's definitely something wrong. I think we need to see the back of the jack plate. Back of the jack plate would help. 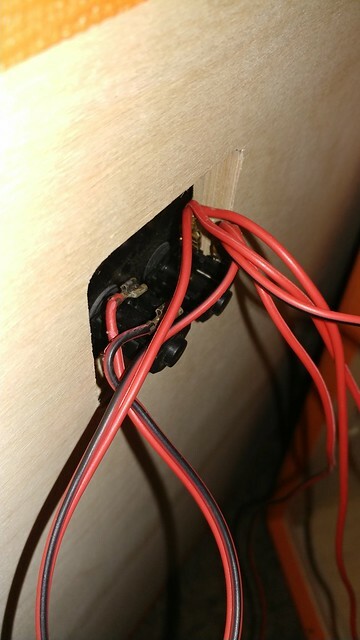 We have the push on spade connectors, at least two splices and the switching jacks, anyone of them could be a poor connection raising the resistance. 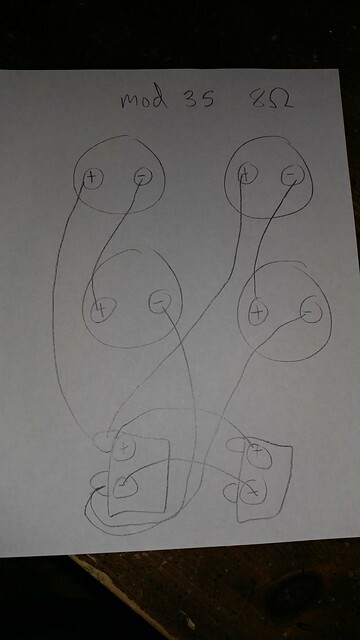 Since they are push on connectors I would pop them off and check each speaker on its own and confirm that they are all good, and I would check the resistance of the splices while the speakers are disconnected, should read zero ohms. One of the splices could be bad or even have a resistor hiding under the shrink tube. I would also replace the spade connectors with proper solder connections, I have seen those fail and fry output transformers a few times. The back of the jack plate will likely provide the answer though, and it may just be that the previous owner/owners never used the link jack which allowed the contacts of either the jack or its switch leaves to become dirty or corroded. Fun stuff, these are great amps, wish I could justify an amp of such size, miss the feel of my pant legs flapping in the breeze. Here is how it is wired. Here are pictures. I am guessing the front solder point on the jacks are positive based off of what wires are running to them. (Don't worry about the upper right speaker wire. It came off when I was taking the back off and I hooked it back up. It looks like it is wired Series Parallel. Should make it 8ohm total and 140watts? Most likely it is one of the spade connectors, the splices or the jacks. Contact cleaner or sandpaper on the jacks, unplug the cables and measure resistance end to end on the ones with splices, should be zero, and clean all the spade connectors, either crimp them down when you reinstall or just replace them with solder. If you keep the spade connectors some flux and some solder on the crimped wire connection is not a bad idea. Got the new multimeter and the readings were still all over the place. I took out the wires and tested each speaker. They read fine. 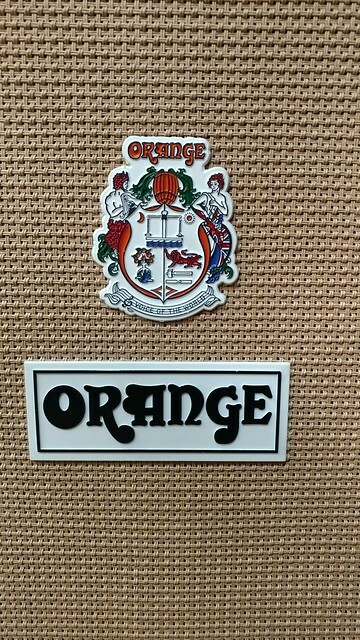 For giggles I used the meter on one of my other speaker cabinets and it read all over the place. I switched a speaker cable for testing with a normal guitar cable and it read right. 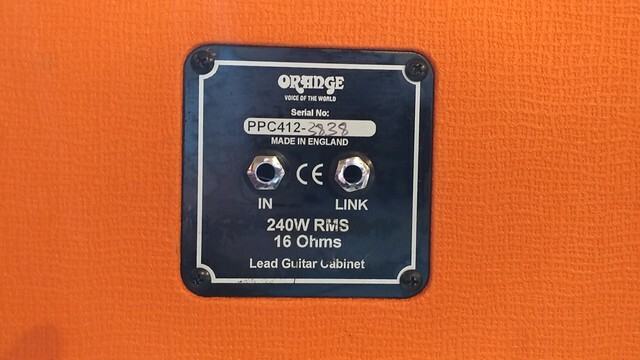 Any idea why a speaker cable wouldn't read ohms right but a normal cable does? I thought the cable might be bad, but it read all over with another cable I know is good. Going to replace the plastic jacks with switchcraft ones. I also got 14 gauge wire to solder it up this weekend.